Rhodri Davies, harp, electric harp; Michel Doneda, soprano saxophone; Louisa Martin, laptop; Phil Minton, voice; Lee Patterson, amplified objects. 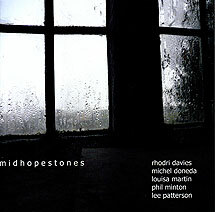 Recorded on 10 January 2009 in the Church of St James the lesser, Midhopestones, near Sheffield. Cover photograph (front cover reproduced above) by Lee Patterson; design: grayscaling@hotmail.com.